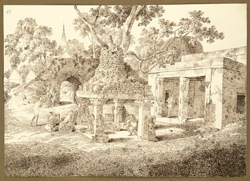 Pen and ink drawing of a small temple, covering the footprints of the Buddha, near the Mahabodhi temple, Bodhgaya in Bihar, by Sir Charles D'Oyly (1781-1845), from an Album of 80 drawings of views in Bengal and Bihar taken between January 1823 and May 1825. The Mahabodhi Temple complex is one of the holiest sites related to the life of the Buddha as it is the place where he attained enlightenment. The present temple dates from the 7th century with later additions, and was built on the site of a previous temple erected by Emperor Ashoka in the 3rd century BC. The temple consists of a central sanctuary with a tall pyramidal tower that is over 50 metres high and houses a large gilded image of the Buddha. The temple is built in front of the Bodhi Tree, the tree under which the Buddha obtained enlightenment, which is surrounded by a quadrangular stone railing that dates to the 2nd century BC. This image is the original drawing for plate 19 of 'Sketches of the New Road in a Journey from Calcutta to Gyah' (Calcutta, 1830). D'Oyly wrote: "This singular pile seems to have been erected for preliminary worships previous to the entrance of Pilgrims into the body of the Sacred Edifice, at the door of which it is situated. In the centre of the sqaure is a large black stone slab bearing the impression of the feet of Bhood and leaning against against the 4 pillars are grey stone images, some rudely and others well and sharply cut. The figures are generally representations of Bhood distinguished by his close curled locks, dismembered nose, and thick lips. The apartments seen on the right hand of the plate are appropriated to the use of the Priests of the Temple."